It’s apple season! Which means it’s time to visit the local orchards and go apple picking and enjoy the bountiful harvest! It’s still a couple hours away from me, but I made a trip to Apple Hill with my mom over my birthday weekend. We went apple picking at an organic farm called Willow Pond Farm, then visited a couple different orchards and farms who sold the apples farmers market-style. We were surrounded by such a large variety of so many delicious looking apples… it was like apple heaven! At Boa Vista Orchards, we bought some amazing apple cider and about 10 different varieties of apples, some with a strictly applesauce-making purpose and some with baking intentions. They even had apple and pumpkin butter, jellies, jams, sauces, and so many more goodies! On a continuing search for more apple goodness, we stopped by Abel’s Apple Acres and tried some apple donuts and apple fritters, and bought more apples. I would just like to say that apple fritters are awesome! Large slices of apple fried up in fritter batter. Absolute deliciousness. In the end, I ended up with a box of apples of varying sizes and types. Once I got home, I even took the time to separate my apples based on what I wanted to make. If you have any questions about what apples are good for baking or sauce, I’d suggest checking out the Cook’s Thesaurus. 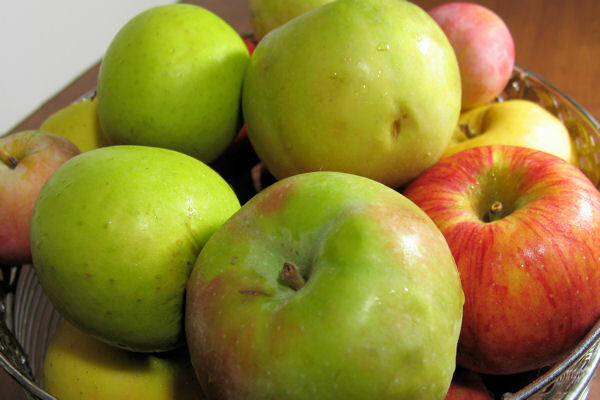 My goals for these apples include apple dumplings, apple pie, various muffins containing apples, and apple oatmeal. Hopefully I get around to trying everything. Cross your fingers for me please! I’ll be sure to report back on what comes out well! Pour about an inch of filtered water into a large, heavy pot. Add the apples and cook, uncovered, on medium-high heat. When it starts to boil, turn heat down to medium-low; cook for about an hour total, or until apples are all tender. Mash the apple chunks with a potato masher to desired chunky consistency. For a smooth sauce, use an immersion blender or food processor to blend until smooth. If sauce is too watery, skim some of the juice off the top. Add sugar and cinnamon to taste. Enjoy cold or warm! Approx how many apples did you use? I still need to get out to the orchards! Usually we go every year around my birthday too, but for some reason we missed it this year. Hopefully the weather will cooperate next weekend, because I’m not giving up on going. I love your apple sauce recipe. I’m a fan of sugar in mine too; although I prefer mine smooth to chunky. 🙂 I can taste it now! Yum! 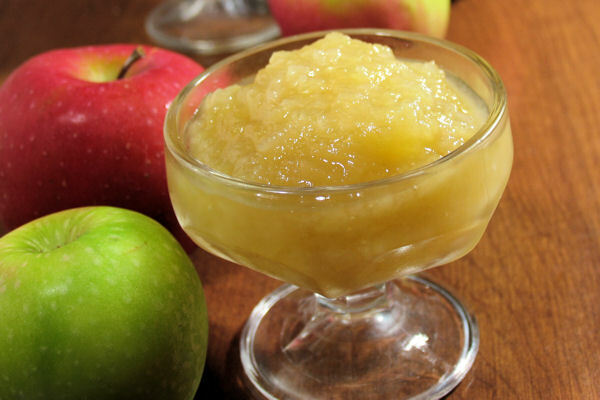 I made my own slow-cooker applesauce last year. This recipe sounds delicious. 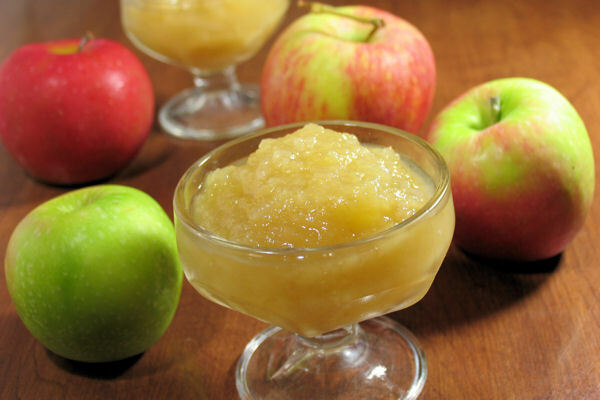 Apples are one of my most favorite fruits, and I really can’t believe I’ve never used them to make applesauce before. I know my kids would love, love it. Sounds like you had a wonderful time apple picking! I’m sure this apple sauce was delicious. I’m going to Julian to go apple picking with a few friends in mid-November. I can’t wait! Apple sauce is so great. I love adding in a few cloves too! Such a great flavour. You can do so much with the sauce – my mother makes pies and cobblers with it, but it’s also so good mixed with oatmeal or just on it’s own! I have been making apple and pear sauces for last three weekends. I simply cannot imagine the rest of the year without them. I love your idea of mixing different varieties. I did it once with peaches and the result was stunning!